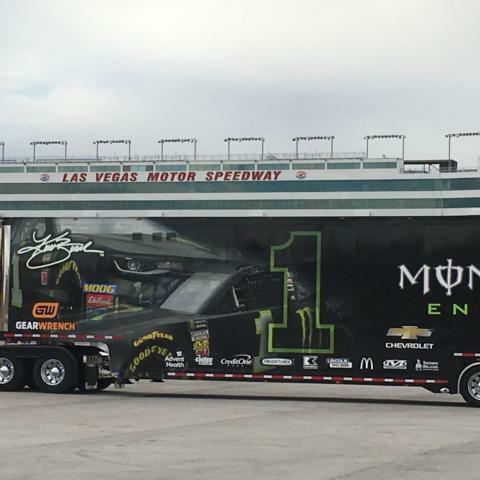 More than 20 NASCAR drivers are primed and ready for arguably one of the most important tests in the sport's history this Thursday and Friday at Las Vegas Motor Speedway. With NASCAR implementing a new aero package designed to reduce horsepower and foster tighter racing for all intermediate tracks' races, including the Pennzoil 400 presented by Jiffy Lube on March 3, race teams will be clamoring for data from drivers and engineers during the two-day session. The LVMS sessions will include drafting practice and will be the sport's first major litmus test heading into the 2019 season, and each lap will be scrutinized from every angle. "It's almost at the very top (of all-time tests), obviously, because this is our one chance to work on communication and the new package, and we have some new players in the shop too, engineering-wise," said Matt McCall, who will be working as crew chief for Las Vegas' Kurt Busch for the first time at this week's test. "We've got a lot of different stuff we need to communicate on, not just between me and Kurt, but also the team and Kurt. So, it's pretty high up there, for sure." Four past NASCAR Cup Series champions - seven-time champion Jimmie Johnson, 2015 champion Kyle Busch, 2012 champ Brad Keselowski and 2004 champ Kurt Busch - highlight a stable of 21 drivers who will be in town for the test, which is free to the public. Other locals returning to town for the test sessions are NASCAR Xfinity Series drivers Noah Gragson and Riley Herbst. "For me, it's just to get behind the wheel and to feel the Chevrolet and feel the drivetrain and to go through a few setup changes," said Busch, who set his home track's speed record of 196.328 miles per hour in 2016. "But I think the most important thing is radio communication and how we want to mock-up certain pit stop sequences for changes as we're out on-track and just having that banter back and forth so when we roll into Daytona, we're best prepared. That's a big reason why Chip Ganassi Racing is having the No. 1 car go do this test is to work the bugs out of it and just work those sequences into how we're going to go attack things in Daytona." This week's action also will be the first for Johnson with crew chief Kevin Meendering, as well as Ryan Newman's first seat time in the No. 6 Ford for Roush Fenway Racing. The track activity will come just more than a month before the speedway's first NASCAR tripleheader weekend of the year, which will be preceded by two days of racing at the LVMS Dirt Track Feb. 27-28. The Strat 200 NASCAR Gander Outdoors Truck Series race and Strat Qualifying take place on Friday, March 1, with Saturday's racing action highlighted by the Boyd Gaming 300 NASCAR Xfinity Series race and the Pennzoil 400 presented by Jiffy Lube anchoring five consecutive days of racing at the nearly 1,000-acre facility with a 12:30 p.m. start on Sunday.